My friends and I arrived to Goat Pond in the Spray Valley in Kananaskis Country in Alberta, Canada late in the afternoon, while the sun played hide and seek behind clouds. 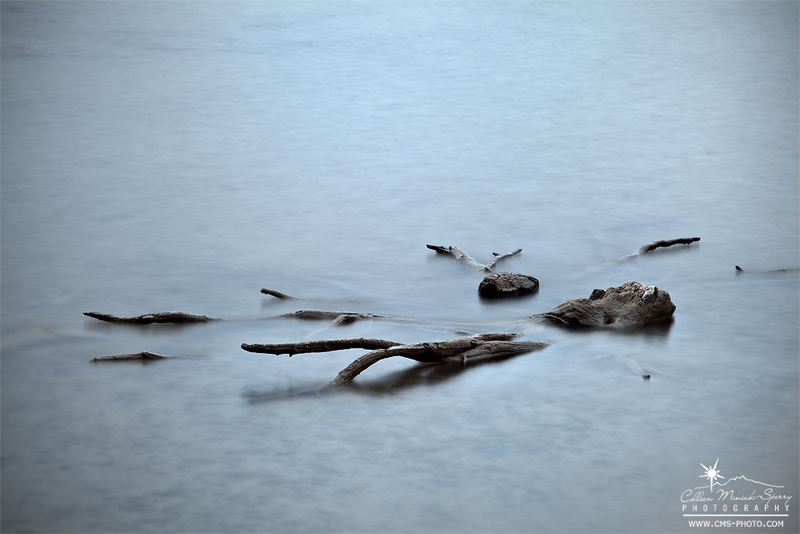 Upon surveying the somewhat barren landscape, I saw the dead branches sticking out of the water and immediately came up with the title (“Skeletons of the Past”) for my photograph. I grabbed my 24-105mm lens, and then set my camera to ISO 100 and f/11 for the appropriate depth of field. This resulted in a 1/40 of a second shutter speed. Easy! Click! After reviewing this first frame, I gasped. It was absolutely horrible and nothing like what I envisioned (see photo on the right). The composition appeared as I had hoped, but the photo lacked the mood and emotion I felt about this particular scene. I wanted it to feel more mystical, ethereal, maybe even dream-like. 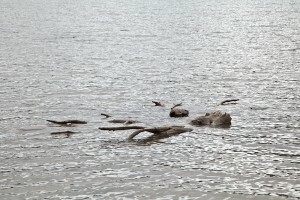 The first (horrible) frame I captured at Goat Pond with ISO 100, f/11 at 1/40 second. I looked up at the sun. Clearly, I could not rely upon the existing lighting conditions to help create that mood. In addition, we hadn’t planned on returning to this location again, so I would have to make do with the hand I had been dealt right here, right now. Paying attention to the words I associated with my vision – things like “mystical, ethereal, and dreamlike” – I turned to my 10-stop neutral density filter to help slow the motion in the pond’s waves to help create those concepts in my photograph. After some experimentation with shutter speed, I settled on 30 seconds, as it provided enough “mystical” but retained structure within the water to still imply movement. I used a Cloudy white balance to help offset the blue hues of the overcast day, but knew when I processed the image later at home, I would add a little blue coloration back into the scene to help convey a more gloomy feel to match the “skeleton” part of my image. Since the scene appeared monochromatic, I tried converting the frame to black and white, but ultimately decided the blue tones helped communicate the coldness I aimed for in presenting the my final vision. Tech info: Canon 5DMII, 24-105mm at 105mm, ISO 100, f/11 at 30 seconds, 10-stop neutral density filter.